The RDX Power Fighter Leather Sparring Gel boxing gloves, also known as the RDX Leather Ultra Gold boxing gloves, are great gloves which although the name implies these are sparring gloves, are great for any use. They’re designed for boxing, but also work well for kickboxing and Muay Thai. As with other RDX gloves, these feature ventilated mesh palms for breathability. The gloves come with a grip bar and an attached thumb, which somewhat limit the flexibility of the hand when clinching for anybody training Muay Thai, but this improve the overall boxing experience apart from that. These gloves also feature a long, angled Velcro cuff, which increase wrist support. The gloves are sold as 10oz, 12oz, 14oz and 16oz variants. We’ve personally reviewed the 10oz versions, so it’s important to note that the fit of the glove is relative to this. The weight is naturally mostly round the knuckles and back of the hand, but the gloves feel well balanced, with extra support from the wrist strap. There is also slightly more padding than in RDX’s similar Power Fighter Cool-X gloves too, which adds a tiny bit more protection and comfort. RDX are focusing more and more on producing gloves with clean, modern looking visuals, as can be seen on these gloves. 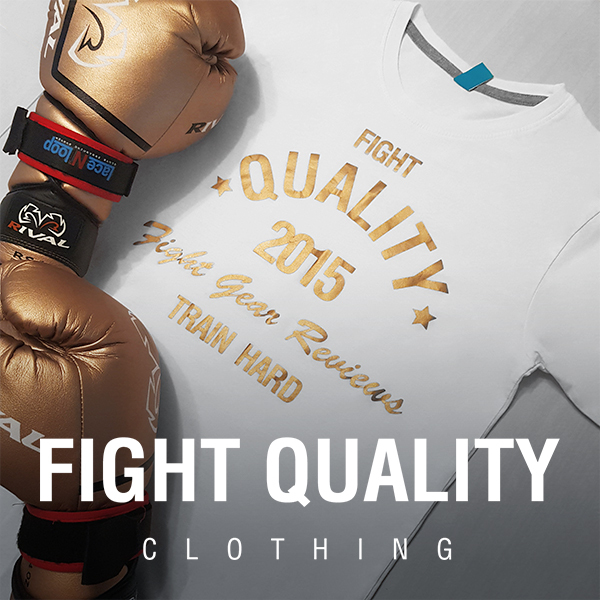 These gold, black and white visuals can be seen across a range of RDX products, including gloves, shin guards and punch bags, so are great for anybody who loves their fight gear and equipment to match. They do only come in this one colour option however, which may be a drawback for people who aren’t too keen on the colour choice. These gloves have a very refined look and feel, and this is reflected in every detail, such as the way the black and white areas on the body of the hand are actually separate sections of leather, carefully stitched together. The angled cuff also makes these stand out from other gloves. As well as the obvious black and gold section along the back of the hand, with RDX’s logos on both here and the cuff, there are also several other visual features which add to the look and feel. The handwritten ‘Power fighter’ text, and the ‘Genuine handmade Nappa leather’ stamp are examples of this. The outside of this glove is high quality cow hide leather, and the inner lining is all a synthetic polyester with an almost satin feel that makes these gloves very comfortable. The padding in these gloves is impressive for 10oz, giving great feedback from punches, without causing any discomfort after even longer sessions. According to RDX, this is down to the gloves’ high-density shell-shock gel technology, which does a great job at absorbing impact. The moisture wicking Dura-Weave Nylon Mesh provides a noticeable difference compared to gloves with a full leather palm, although breathable gloves are fairly standard now. The gloves are machine made, which can sometimes hint at a rushed production that leads to a lower quality, however RDX did a good job on these. The stitching is neat in all areas, often double stitched in places for durability. Around the edges of the glove, the folds in the leather are very neatly done, with the leather stretched tight around the glove and despite frequent use, there is no evidence of the material crumpling, like often happens on cheaper gloves. The thumb position feels natural on these gloves, and isn’t too far forward. The hand compartment felt quite tight when I first got the gloves, especially with hand wraps on, but it after a couple of sessions they broke in a little, and now feel like a great fit. The gloves fit the width of the hand well too, so are a good choice for anybody who gets fed up with too much space inside their gloves. The unique Velcro cuff is both a blessing and a curse in one. The way that they wrap all the way around offers great wrist protection, and with the added angle of the cuff means that these don’t suffer from as much accidentally bending when in use as other gloves sometimes do. On the flipside, these can be a pain to take on and off, as you have to flip the strap all the way around your wrist, which slightly defeats the point of Velcro gloves, which are supposed to be easy to take off and on again. This is only really an issue when you want to take them off quickly between rounds though, and wouldn’t be a problem at all for competition use for example. Size wise the gloves are fairly standard compared to others of the same weight. In my opinion these are great all-rounder gloves, 14 and 16oz’s will make suitable sparring gloves and 10 and 12oz’s would be better suited to pads. I’d highly recommend the heavier weights to any beginners looking for a good starting pair of gloves for both pads and sparring, and the lighter weights to more experienced fighters looking to get a pair specifically for pad work. If looking purely for sparring gloves however, I feel that there are better brands available. These gloves are sold by RDX for around the £40 mark, which is at the higher end of their products, however the added features and comfort compared to their budget gloves make them worth it. These gloves are still at a fairly affordable range for beginners or people looking for a second pair of gloves. I would say these gloves find a great medium between affordability and high-end features. Please note: RDX Power Fighter Leather Sparring Gel Boxing Gloves range has now been replaced, but the full range of gloves can be found at the link below.